The fundamental idea of the Juvenile Court Law is that the State must step in and exercise guardianship over a child found under such adverse social or individual conditions as develop crime...It proposes a plan whereby he may be treated, not as a criminal,...but as a ward of the State, to receive practically the care, custody and discipline that are accorded the neglected and dependent child, and which, as the Act states, "shall approximate as nearly as may be that which should be given by its parents." In 1902, a Children's Court was established in Manhattan (New York County); this became the first county in the country to have a children's court housed in its own building, the former Department of Public Charities Building on Third Avenue and 11th Street (demolished). This court was a division of the Court of Special Sessions and was still required by law to treat children in the same manner as adults. In 1915, the Children's Court was established as a separate court and in the next year it occupied a new courthouse on East 22nd Street that had been begun several years earlier. The site on East 22nd Street was probably chosen because of its location near several social-service organizations that dealt with issues relating to children: the New York Society for the Prevention of Cruelty to Children, which maintained its headquarters in a building on Park Avenue South at East 23rd Street; the Children's Aid Society housed in the United Charities Building; and, most importantly, the Charity Organization Society (also located in the the United Charities Building), which was instrumental in the organization of the Children's Court. The Children's Court is an imposing Classical Revival structure faced with limestone. The design is characteristic of public buildings erected in the early decades of the 20th century. The four-story building has a high rusticated base, two-story Ionic columns, and a full attic. In 1937, a bridge was built connecting this building to the new courthouse erected to the west. 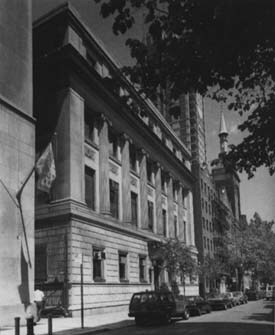 In 1959, the building was converted for use by Baruch College; the exterior remains unchanged.